Whilst at work, a laboratory technician discovers a strange substance. The liquid, which obviously possesses some form of intelligence, compels the technician's dog to drink it. The dog then mutates into an alien being. 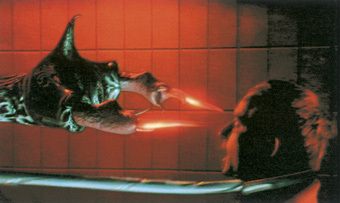 This creature starts to feel bothered by the scientist's curiosity, and a fight to the death begins. Matthias Wittmann was born in 1971 and studied Theater and Audiovisual Media at Erlangen University from 1992-1994. He attended the Film Academy Baden-Wuerttemberg in Ludwigsburg from 1994-1999, specializing in Animation. After graduation, he worked as freelance animator and previz artist for productions like Joe Flie (IMAX-3D), The Little Vampire, Down and Equilibrium. He has received several awards, including the aAnimago 3D Award in the Animation Art category for the project Digital Body -Frankenstein (1997), and the New Talent Award in the Visual Effects category at the Mecon 1999 for Letters. Since 2001, he has been working as VFX Supervisor-Digital Artist at Elektrofilm, Berlin.